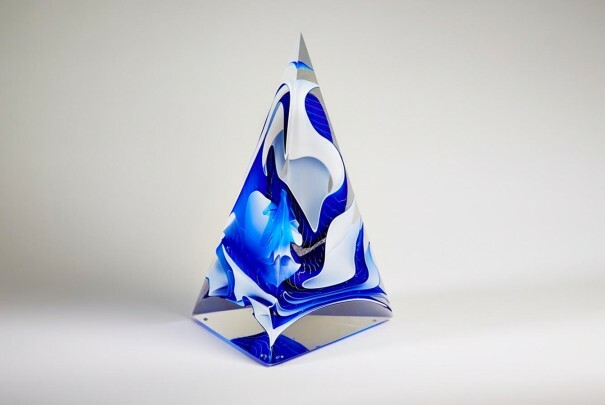 London Glassblowing is proud to represent some of the best of British practicing contemporary glass artists. 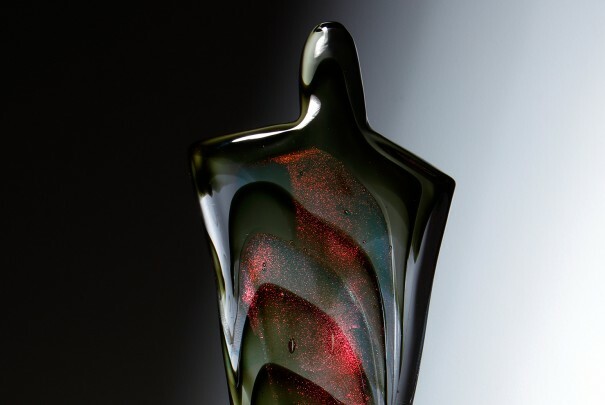 Hugely talented and constantly pushing the boundaries of glass, our artists master various techniques such as free blowing, casting, fusing, hot sculpting, cutting and polishing, and everything in between. 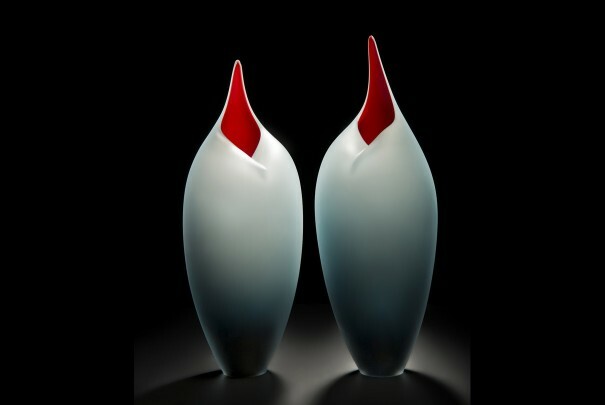 Their work is dynamic and on the cutting edge of contemporary glass in the UK. We are extremely pleased to represent them and their incredible work, while encouraging their artistic careers through our vibrant exhibition programme. Our 10 resident artists feature heavily in our exhibitions throughout the year, and we have embarked on a Featured Artist programme to spotlight their work in depth. Work by our resident artists is always available and we routinely organise commissions for their work on our collectors’ behalf. Glass creations from our guest artists are also on display in the gallery, and we often invite them to take part in our exhibition programme. Our guest artists come from all over the world and cover a wide range of disciplines. If you would like to learn more about a specific artist’s practice, simply click on the image of their work. 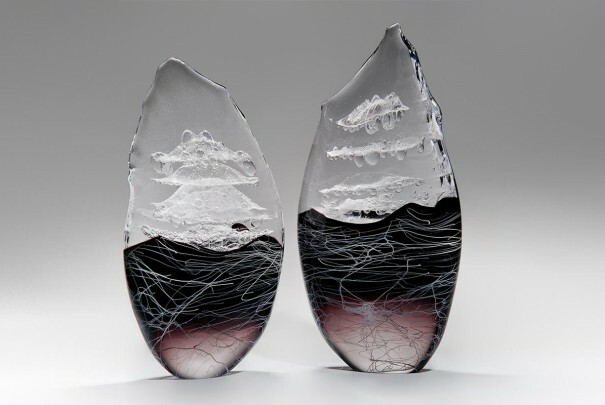 James Alexander uses glass as a canvas to create abstract sceneries, drawing inspiration from the erosion of the coastal area where he grew up. 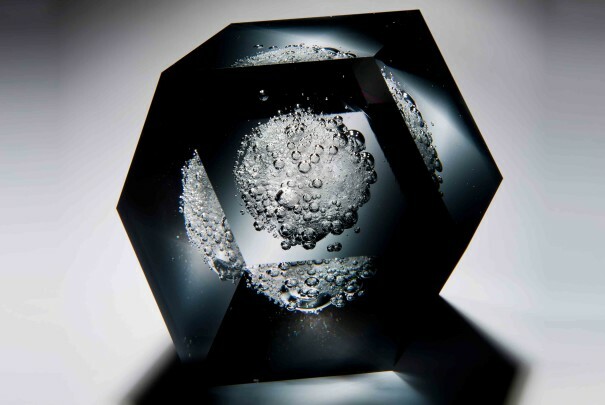 Karen Browning demonstrates her mastery of casting in black glass, employing its inky depths to alter perceptions of space. 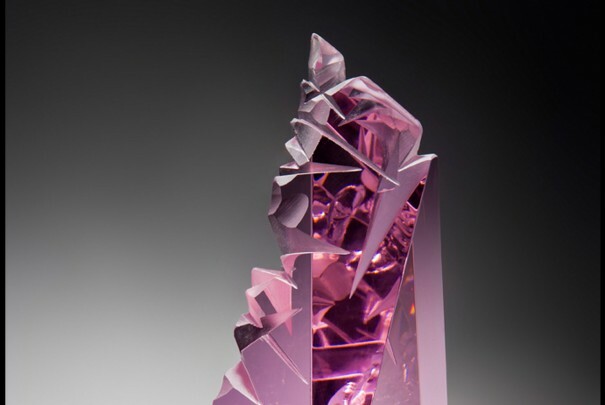 Inspired by celestial bodies and the natural world, Sabrina Cant's coloured and cast pieces capture an ethereal light. Renowned for his hot-chipped technique used in his elegant and dramatic Clovis series, James Devereux is a highly skilled artist. 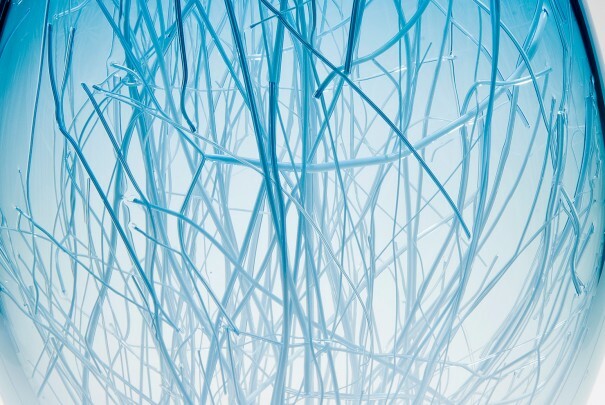 Smooth organic forms play with the perception and contrasts within the material itself, in Hanne Enemark's work. Enemark & Thompson share a common interest in the tension between chaos and order, fragility and strength, internal structure and external form. 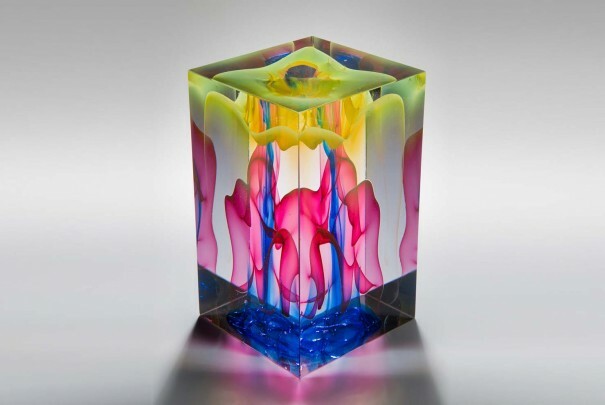 Founder of London Glassblowing, Peter Layton has developed a reputation for his particular flair for colour, form and texture. 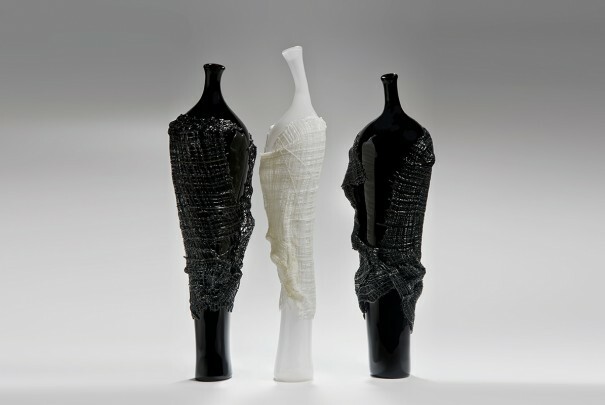 Highly productive at 80, he continues to create new series and explore new methods of making in glass. Stripping back form to achieve an exquisite simplicity is Bruce Marks' main focus, simultaneously merging simplicity of form and colour while retaining their definite qualities. Combining blown and cut elements which are kilnformed together, Cathryn Shilling & Bruce Marks explore organic, natural forms and shapes. 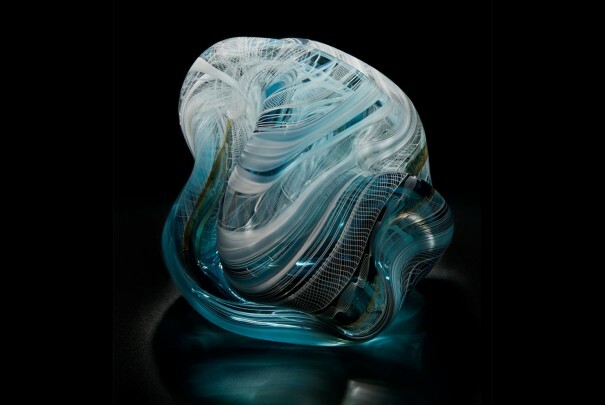 Laura’s fascination for glass as a creative medium stems from its capacity to constantly alter her initial thoughts and expectations. The spontaneity of the hot material demands instant visual judgments that give rise to shifts in her ideas. A curiosity with the mutability of materials drives Harry Morgan's work. 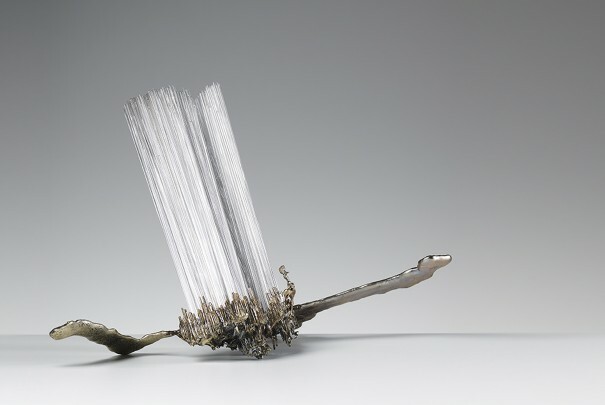 His eroded, organic forms explore the ways glass and steel can be combined for great interest. 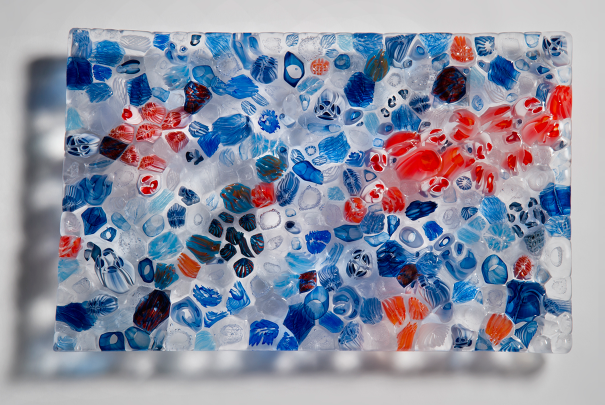 Nick Mount is one of Australia’s most accomplished and celebrated studio glass artists. 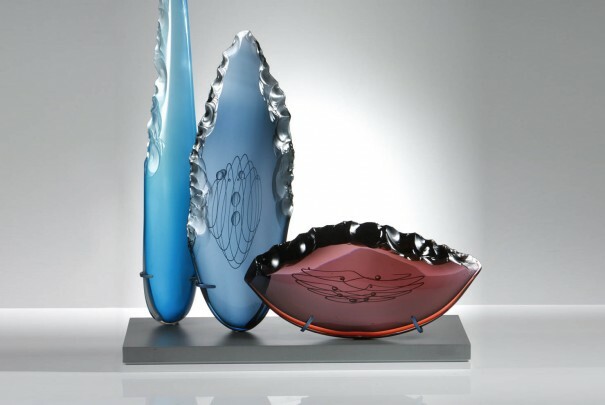 He has been at the forefront of innovation and achievement since the early 1970s, now imagining still life traditions in glass. 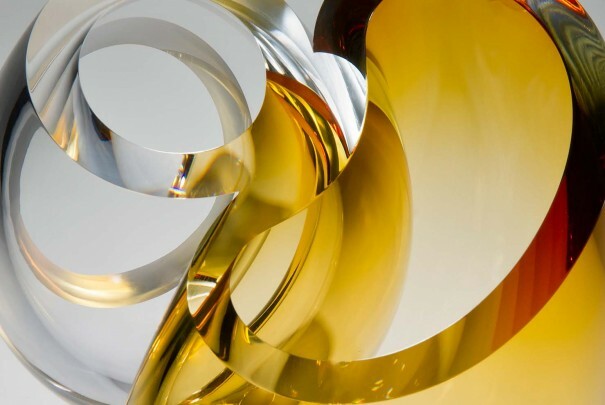 A German-born glass artist, on the cutting edge of contemporary glass, literally. 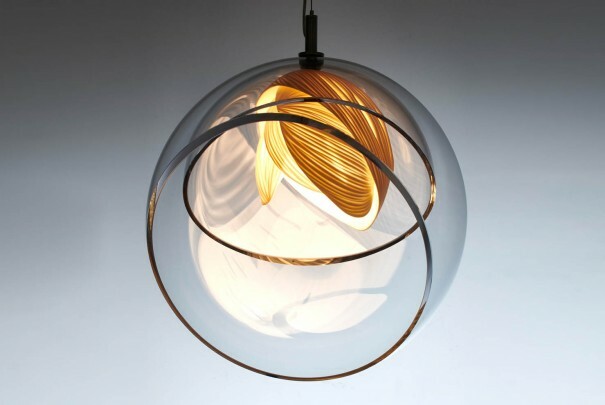 His cut and carved optical pieces have earned him wide acclaim. 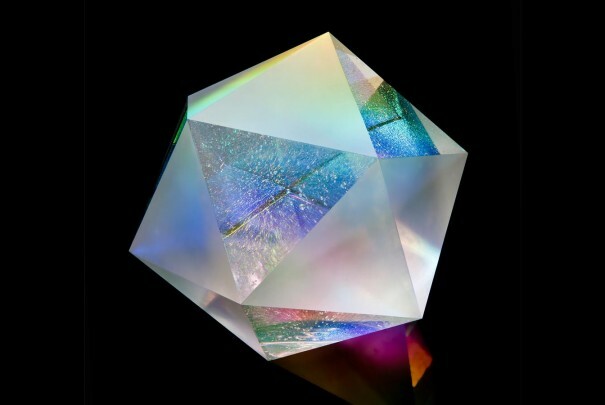 Master coldworker Anthony Scala takes pride in the exacting nature of his pieces. 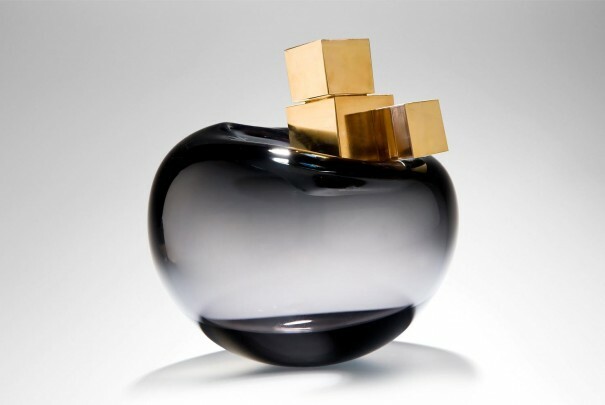 Combining crystal clear optical glass in precise geometric shapes, his work is futuristic and highly architectural. A childhood in Wales inspired Ruth Shelley's love of colour. 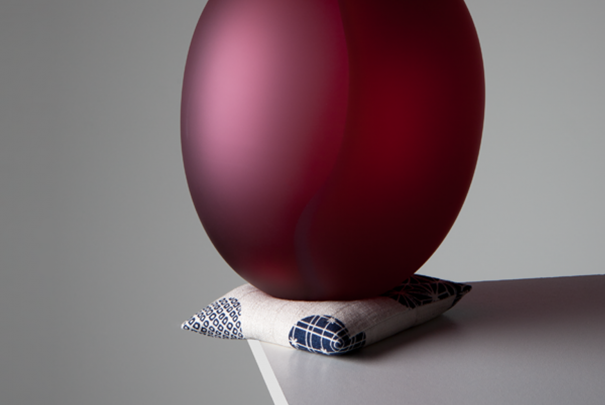 Initially trained in textiles, she now translates that passion for colour into kilnformed glass. 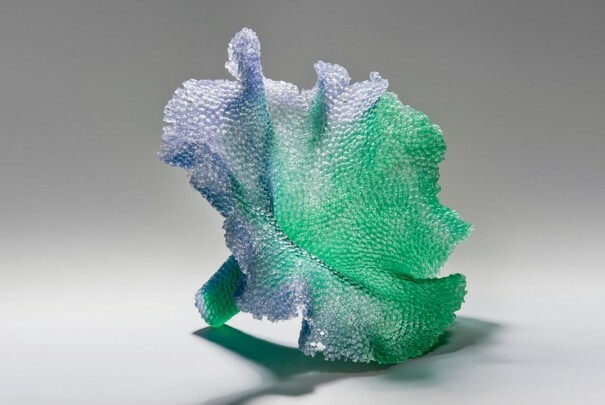 Mixing form and fragility, Cathryn Shilling's kilnformed pieces imagine fluid fabric in glass. 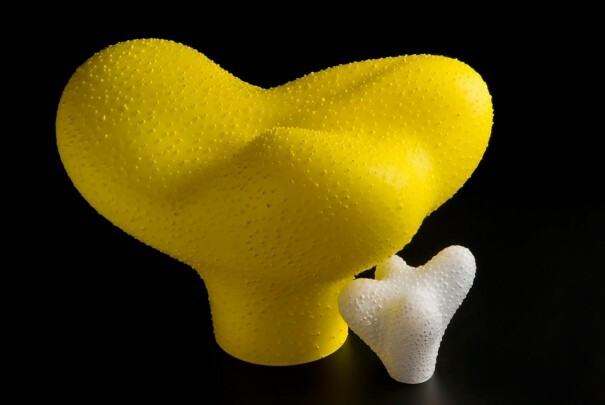 Sometimes incorporated with organic blown forms, her pieces refer to the body and its coverings. Louis Thompson’s work plays with ideas of illusion and perception. He explores ideas of transparency and solidity of form; internal structures that can exist in both in solid and hollow objects. Colour, light and their interactions are continually fascinating to Tim Rawlinson. Working in glass provides endless potential to explore each one. World renowned for his poignant cast pieces, David Reekie draws attention to issues arising in society with his masterful work. Liam Reeves' sleekly blown pieces belie their complexity, juxtaposing the historic technique 'reticello', with a modern colour palette. A hugely skilled maker, Layne Rowe's work combines many steps to achieve a breathtaking finale. Incorporating filigrana and double colour fades, his pieces have exquisite beauty, belying their complex construction. 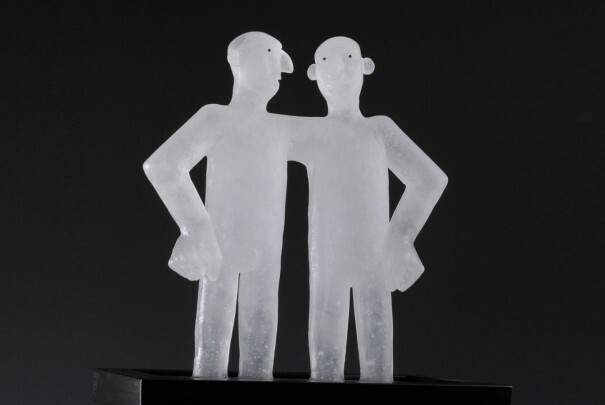 One of very few glass artists working in figurative traditions, Elliot Walker's sculpted work challenges our perceptions of what is real and what is created.